Eric Cordingley of the Friends of Multnomah Park Cemetery continues to look for Morningside Hospital patient burial sites. 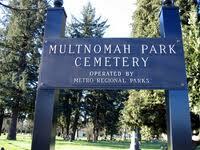 His search has expanded to include at least 5 cemeteries since his first discovery of patient graves at Multnomah Park. Last month he sent this report on his continued pursuit of the final resting places of Morningside patients. Thanks for all you hard work, Eric! September 19, 2011: I ventured over to Riverview and Greenwood Hills today with the hope of finding at least one Morningside headstone. Riverview: The area where most of the Morningside burials occurred, between 1924 and 1929, underwent a massive landslide sometime in the 60's. It could have happened during the October 1962 Columbus Day storm when many large trees at Riverview went down. The area on the map, section113 was dramatically altered as part of a large earth movement toward a gulley which undermined two roads and a large retaining wall. Any remains that were in that area may have been either covered over by the slide or by the large amount of concrete, rock and dirt fill that went into the hillside to stabilize it after the slide. If remains were exposed during the slide, I am sure the Riverview staff collected them and reinterred them in an area away from another potential landslide. In Section 11, I attempted to locate the grave of one Herbert Hurdman, a Morningside patient that died in 1929. I was unable to locate a headstone for him. Greenwood Hills: Recent hot weather has made the ground dry and thus very difficult to probe. I was able to locate several flat concrete markers. I don't know if the markers I located are for Morningside patients. It is my belief Morningside patients were interred at Greenwood Hills beginning mostly in 1942/43 until the hospital closed, but I do not as yet have access to the quarterly reports beyond 1931 and I have not been able to build a list of former patients who may be interred at Greenwood Hills. The Volunteer Coordinator for Friends of Greenwood Hills Cemetery, Mary, is unavailable, due to her work schedule, to assist in this project until sometime in October. I will report on our meeting once it occurs. Multnomah Park: Attempted to locate grave of Ilook Dayton d: 1942 - records have him in either C129 or F129 - so far unsuccessful. Attempts to locate graves of Archie Brown and James Ebena continue.. Searched in Section E in an area that was filled in during April and May of 1942 - nothing yet...(dammit!!) Archie Brown is listed as being interred in F189, along with Charlie Waters, but there IS no F189 . . . ! My previous assertion that James Ebena was interred in F, 191 was in error. My apologies. During the annual conference, I believe there was mention of a Letter of Introduction that would allow me to interview mortuary and cemetery staff in pursuit of information of Morningside patients. A letter of this nature would be very helpful in this work. Rose City Cemetery - There is a large section that was used for indigent interments from 1904 until about 1940. A check on some names I thought might be there came up empty. Another trip or two to the State Archives may offer some death certificates listing Rose City as place of interment. Oregon State Hospital - Unclaimed Cremains - The remains of Morningside patient Rasmus Olsen Gjerde who died in June of 1941 are being held at the hospital. Cremations: The possibility that the bodies of some Morningside patients were incinerated has been confirmed. Lena May Dackins, who died in 1941, was cremated at Riverview Abbey. Her cremains were held there until 1960 at which time they were scattered in the woods behind the Abbey along with many other sets of unclaimed cremains. It is unknown at this time why her remains were incinerated instead of being interred at either Multnomah Park or Greenwood Hills. If Holman & Son has a file for her, it might give a reason. I believe other patients' remains may have been incinerated, but this is as yet, unconfirmed. Autopsies: I note on some death certificates that the remains of Morningside patients, especially after 1939, were subjected to autopsy. I wonder if this was a requirement of the contract with Dept. of Interior or ??? 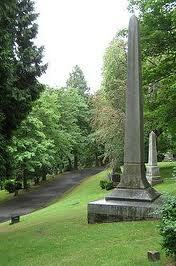 I am still very much enjoying the challenge of searching for the final resting places of Morningside patients. As former patients are located, they will be added to the virtual cemetery on find-a-grave.com.